The woman adroitly pushes the shuttle though the loom and a beautiful flower blooms before the eyes of the curious visitors. 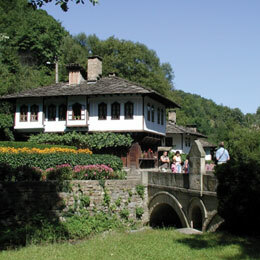 Even if you have already been acquainted with the traditional Bulgarian motley carpets, pots and icons they all seem to take on additional meanings here, at the unique open-air museum Etar where the Bulgarian Renaissance atmosphere is recreated by the old-time workshops of local art. The fast pace of everyday life and office assignments left behind, one can see in the craftsmen the pure embodiment of Bulgaria's traditions, the industriousness and patience that it people are known for. The Etar stands as a symbol of Bulgarians' attitude to its traditions and its past. Being the first ethnographic museum of the SKANZEN type built in the open, it was brought into being to give traditions new life and bring them intact into the present. The Etar is not alone in this, standing in line with a number of picturesque villages and museum towns, which have many fine examples of historic works of art and primary-coloured examples of architecture - Tryavna, Koprivshtitsa, Zheravna, Kotel, Melnik, Bansko. Bulgarians have earned much praise for their heroic past and original traditions. It is indicative that as the country opened to the world and the popularity of non-native holidays went outside the foreign communities in the country, Bulgarians became even more eager to cling to their traditions, cherish them and go back to them as a source of strength and wisdom. In some parts of the country, such as the Rhodope Mountains, traditions are neither a thing of the past, nor a tourism attraction, but an inseparable part of everyday life. In the villages girls' mothers prepare the dowry for the long-awaited wedding day, while during holidays central squares fill with a seething, brightly-colored multitude, moving to the sounds of traditional songs. This is just the sort of thing that might be seen as welcome evidence of a zeal to handle with the past, use it as a prop and move ahead. This holds true for every country, you may retort and with good reason. But for a small country like Bulgaria the potential of the people, their values, personal qualities and talents are of crucial importance in the race for world renown. I have often witnessed how enthusiastic foreigners become when talking about the potential of the nation, all of them - diplomats, businessmen, ordinary people - calling it Bulgaria's treasure. Sportsmen and artists have become Bulgaria's best ambassadors abroad, adding talent to the traditional Bulgarian recipe for success - patience and industriousness. Among them are opera celebrities of worldwide renown - Gena Dimirtova, Rajna Kabaivanska, Nikolay Gyaurov, Alexandrina Pendachanska, violin virtuoso Mincho Minchev, known-for-his-fiery-temper football star Hristo Stoitchkov and conceptual artist Christo. John Atanasoff, the inventor of the first digital computer, has repeatedly spoken of the pride he takes in his Bulgarian origins and fatherland. His unique mind and talent have been inherited by the students, who sweep first prizes at world Olympiads and the country's well-known and widely appreciated IT specialists. Despite the abyss between IT education and real business, Bulgaria continues to hold lead in the area among South-eastern European nations. If travelling around Bulgaria you decide to get acquainted with more than travel brochures images, don't forget to venture out in to the night of the big cities and experiment to find out today's Bulgaria. With the buildings softened as the sun sets and the neon lights switched on, you may happen to rub shoulders with some of Bulgaria's high tech talents or future Goodwill ambassadors.